I recently was given the opportunity to visit the town of Aurora, NY for a trip with home decor and lifestyle brand MacKenzie-Childs. I was a fan of the brand before this trip, but to say I gained a whole new appreciation for the craftsmanship doesn’t even cover it. 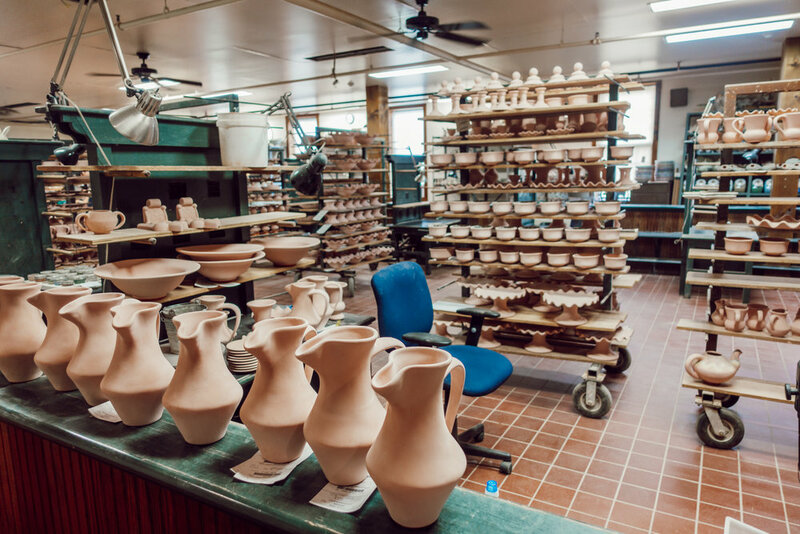 Many pieces of furniture and all ceramic pieces are handmade and hand-painted right there in Aurora. MacKenzie-Childs shares joy through designs, and that motto is ever so evident when you visit the grounds and farmhouse. As soon as you arrive on the property, you know you've at a very special place. 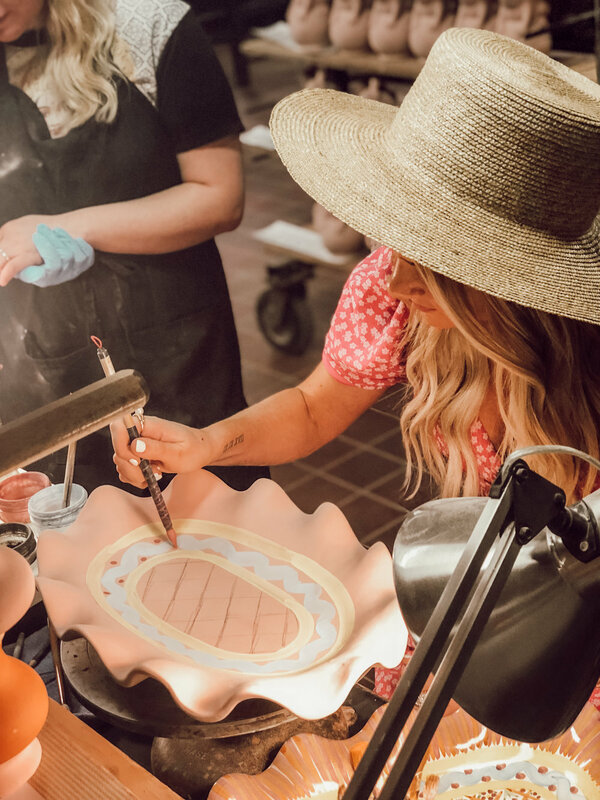 An old dairy barn houses the MacKenzie-Childs production studio where hand-decorated pottery, furniture, and home furnishings are crafted by talented artisans. 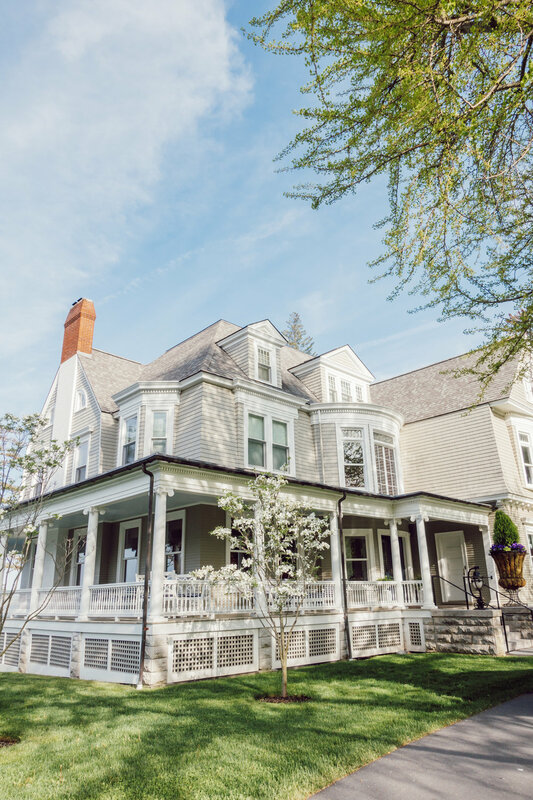 The grounds are also home to colorful gardens, a farmhouse decorated in all MacKenzie Childs designs and a retail shop. The Farmhouse might have been my favorite part of the whole trip. Its whimsical and colorful designs reminded me of something out of Alice in Wonderland. We had the privilege of taking a production tour. I was blown away to find out that one piece could take weeks to make from start to finish. When you see how many hands and processes go into making one single piece, the price point makes total sense. It takes a lot of teamwork whole team really feels like a big family. We also got to try our hand at decorating some of the pieces and creating our own tablescapes the stores. We stayed right down the street at Rowland House, one of the one of four lovely Inns of Aurora. 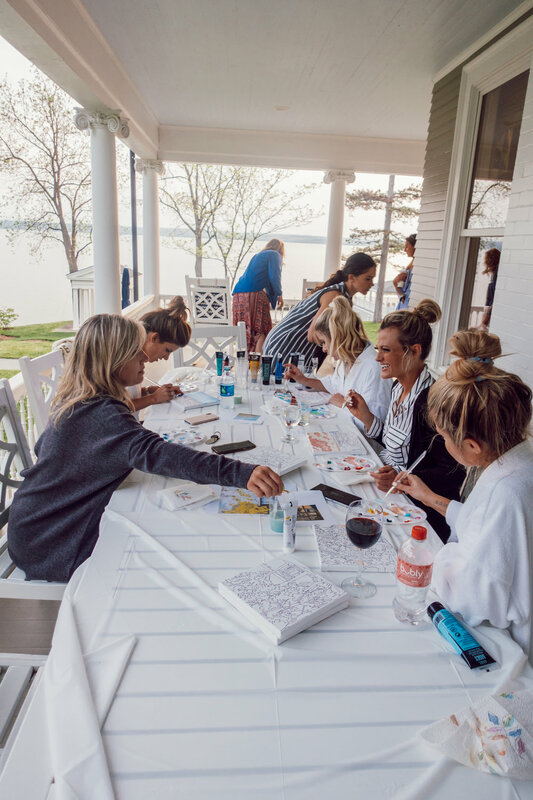 There’s nothing better than coffee on the rocking chairs on the back porch in the crisp morning air… or snuggling up around the fireplace at night and sharing open and honest conversations with strong, like-minded women. It was so cozy and truly felt like a home. Cody, the innkeeper, was such a delight and made each and every one of us feel so at home. The Inns are located right down the street from the MacKenzie-Childs property. Now you might be wondering… how does MacKenzie Childs fit into the style of MY home? I would describe my home style as vintage-inspired bohemian with pops of gold and fun colors. Many people think of MacKenzie Childs as a more classic brand… or maybe they’re only familiar with the bold Courtly Check. Perhaps you were introduced to the brand by your grandmother or aunt like I was. After this trip I can tell you that there is SO much more to the brand than meets the eye. A few of my favorite collections are the Sweetbriar and Flower Market. I also love how the bold and whimsical designs can add a fun pop of color to any style. I can't wait to incorporate my new MacKenzie-Childs dinnerware with my great grandmother's china. I never thought I’d be a fan of the check pattern. After seeing the beautiful Parchment Check pieces in person, I’m totally a believer. I loved hearing the story behind Parchment Check, the more neutral version of the brand’s signature black and white Courtly Check. Rebecca, the brand’s creative director, has been there from very early on and worked under the founders, Victoria and Richard MacKenzie-Childs. Her inspiration for the Parchment Check pattern came from her grandfather’s letters to her grandmother while he was away at war. After many years, she uncovered the letters. The way they were folded created a grid pattern and the Parchment Check was created. This heartwarming story is just one of many examples of the intentionality behind every MacKenzie-Childs collection. This trip to Aurora was truly something special and inspired me to be more intentional with my décor. Rebecca told us to think of our home as our diary and that really stuck with me. One of my other favorite aspects of the trip was connecting with so many other amazing bloggers and influencers. Each and every one of these women inspire me in a different way and I feel so lucky to have met them. We all hit it off from the get-go and had the best time getting to know each other and sharing conversations. Be sure to check them out below.